Note: This feature is only available in Excel for Windows if you have Office 2019, or if you have an Office 365 subscription. If you are an Office 365 subscriber, make sure you have the latest version of Office. Set up your data like the above example. Use one column for the stages in the process, and one for the values. 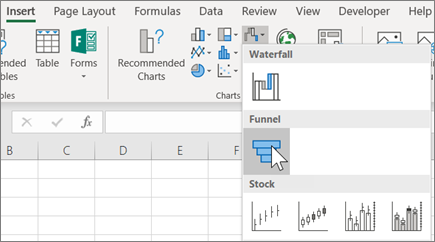 Click Insert > Insert Waterfall, Funnel, Stock, Surface or Radar chart > Funnel. Note: This feature is only available in Excel for Mac if you have Office 2019, or if you have an Office 365 subscription. If you are an Office 365 subscriber, make sure you have the latest version of Office. On the ribbon, click the Insert tab, then click (the Waterfall icon) and select Funnel. Tip: In Excel for Mac, use the Chart Design and Format tabs to customize the look of your chart. If you don't see these tabs, click anywhere in the funnel chart and the tabs will appear on the ribbon. Click Insert > Chart > Funnel. Note: This feature is only available in these applications if you have Office 2019, or if you have an Office 365 subscription. If you are an Office 365 subscriber, make sure you have the latest version of Office. Click an empty space in an email message, presentation, or document. The funnel chart will appear. And, a small window with example data will appear. Change the numbers to your own. Tip: At the top of the data window is the Edit Data in Microsoft Excel button . Click this button if you want more room to work with the data. To add the names of the stages, right-click anywhere in column A, and then click Insert. Click Entire column, and then click OK. Type the names of the stages in cells A2, A3, and so on. At the top of the program window, click the Design tab. Note: In PowerPoint, you may have to move the small data window down to see the Select Data button. The Select Data Source window will appear. And, dashed lines will appear around the second column of data. In the data, click and drag to select both columns: the stages and the values. When you're done, the dashed lines should surround the two columns. In the Select Data Source window, click OK to close it. Now close the data window. Or, if you opened Excel to edit your data, close the Excel window.